One of the most important ways you can contribute to NASCO Institute is by helping spread the word to your friends, colleagues, and neighbors. Here are some tools to help get the word out. Promote the NASCO Institute in all your favorite places! Download a PDF of this year's poster or email info@nasco.coop to request a stack of posters to distribute within your networks. This year’s art features a cross section of a pine tree to represent NASCO’s legacy of cooperation. In 1922, the National Cooperative Business Association originated and trademarked the twin pines symbol used to represent North American cooperatives. "The pine tree is an ancient symbol of endurance and immortality.” Every growth season, a tree adds a new layer of wood to its trunk and limbs. 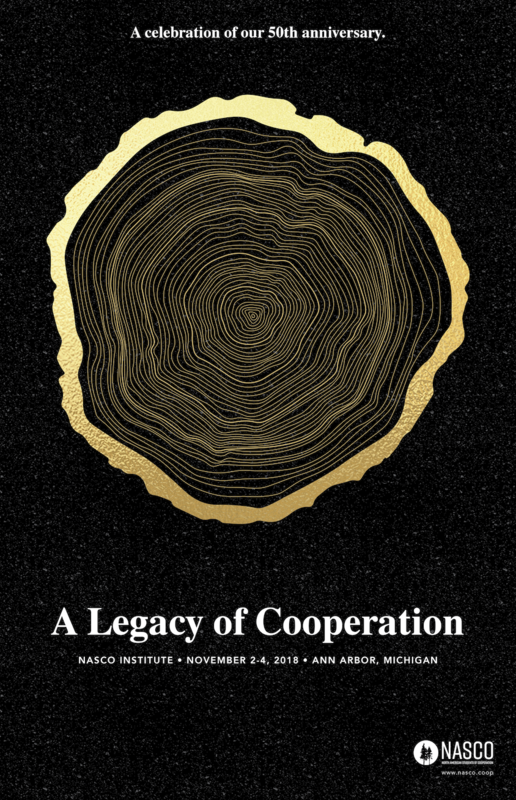 There is one tree ring depicted for each of NASCO’s 50 years.